Suzie Volunteer has recently signed up with Connie Coordinator, the Airedale rescue state coordinator in her area, and is excited and a bit nervous as she waits for her first assignment as a new Airedale rescue volunteer. Suzie lives in the opposite end of the state from Connie and has had little or no opportunity of personally going with Connie to “learn the ropes” about doing rescue, but has read everything she could to learn. Then the call comes! Connie wants Suzie to do a home visit in her area. “Do you think you are ready to do this?” Connie asks. Suzie replies, “Oh, I’m sure I am!” Connie then emails the application from Joe and Mary Applicant to her and Suzie is off and running with her first rescue volunteer assignment. The first thing Suzie does is to carefully read the responses on Joe and Mary’s application, which will give clues on things to look for during the home visit. What are the ages of the family members living in the house? When there are very young children, how does the family handle the doors to the outside. 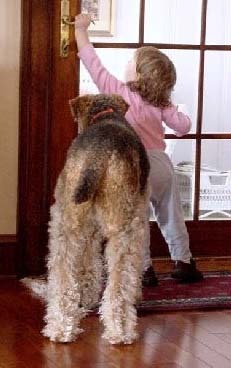 Are there barriers to protect the new dog from escaping through an open door when a young child opens a door without an adult there to supervise the dog? When there are young children there are baby sitters. Are these sitters good with dogs? What special precautions does the new family plan to take to keep the new dog safe when baby sitters are in charge? Are there teenagers in the household? If so, expect to have young adults constantly opening and (sometimes) closing doors and gates to the outside. How does the family intend to handle this situation with a new dog? Does Grandma live with the family? The children want a young dog, of course. Will a young dog be the best fit? Will Grandma be as excited about getting a frisky young Airedale as the rest of the family? Will she be comfortable with the Airedale Susie brings with her to this visit? Will Grandma seem quite careful not to be jumped on or apprehensive about being knocked down? The information Susie can gather will help a volunteer make a better match when deciding on which Airedale might be appropriate. Maybe an older dog would be a better choice for this family. Is this an active family? What level of activities and sports does the family enjoy? Where will the rescue dog be during these times? Which activities, if any, will the dog participate in? If they are runners, do they intend to have the dog run with them? On or off lead? Are Joe and Mary both employed? What days and hours are they are away from home? How long would a new dog be left home alone on work days? Do they ever employ the use of a dog sitter to come in mid day? When they go on vacation, where will the dog be? If staying with a family friend or relative, what type of living conditions and security will the dog enjoy with that family/person? Remember, Susie is still reading the application responses. She has not contacted this family yet, and she already has a list of questions she wants to ask! After Susie finishes looking through the application, she is ready to make that call to Joe and Mary Applicant and schedule the appointment for their home visit. Susie knows it is very important to have all members of the household present for the home visit, so when she contacts Joe and Mary to schedule an appointment she will be sure to make that request. She also knows this might not always be possible, but she will stress the importance of it and do the best she can. She will definitely want the principle caretaker of the dog at this home visit. Susie also plans to make the appointment at a time she won’t be rushed. A home visit will probably take an hour or more. This is a one-time visit to gather very important information and she wants to feel comfortable and take all the time she needs. Taking an Airedale with her for this home visit is very important. Susie plans to take her Airedale, Dale, with her. Dale will be properly groomed if possible, and at the very least freshly bathed and brushed. Dale doesn’t have to be perfectly mannered (and he usually isn't). Susie knows Dale will run crazy through their house and plans to keep him on lead during the visit. Susie has also read that if Dale was dog aggressive, or not reliable around children, and she is not comfortable or capable in controlling that, it would be best to borrow a friend’s more mellow Airedale to take on the visit. She doesn't need to worry, though, Dale is pretty well-adjusted. Susie plans to learn quite a bit by having Dale with her. She will watch how the family members react to Dale. Do they want to rush up and pet him? Do they talk to him? Do they ignore him? Do they encourage her to “Oh, let him go...” when he wants to explore their house? Do they have “off-limits” areas in the house? Finally the big day comes and Susie gets ready for her first home visit! She read that it was fine to have a small notebook and pen with her for any necessary notes she might not remember, like the home pet’s names. She also remembers she should NOT make notes throughout the visit. She has made a list of one or two word reminders for each question that she would like to ask, and plans to refer to them as casually as possible. With experience she knows she won’t need the list...but this is her first home visit and she wants everything to go smoothly. Susie starts making mental notes upon arriving at John and Mary’s home. What kind of neighborhood is it? Is the home on a busy or quiet street? Are loose dogs running in the neighborhood? At the front door, would it be easy for a dog to escape? Is the home neat or cluttered? Are there obvious antique and fragile items the dog would be in contact with? Are medical supplies/pills, chemicals or other dog-dangerous items within reach of a curious dog? Does this appear to be a dog-friendly home or one that would require the dog to be contained in certain areas of the home? Her impressions on the above, plus her impressions of the family members and their interactions with Dale are all very important and will be noted in her written report. One of her jobs as a home visit volunteer is to observe the interaction between family members. Do the children seem well behaved? Are they respectful of their parents? Susie watches their facial expressions...these can tell her so much, but only if she remembers to watch. How do the children react to this big dog? How does Grandma react? Susie plays close attention to all of this and learns much more than she ever learned by only reading the application or listening to answers to questions. How do the other pets in the house react to Dale? Remember my story in last month’s article about the white cats and their reaction to my Airedale Shannon when she came into their house? That was definitely a rare experience, and no, placing an Airedale rescue with those cats was not approved as a good home for one of our rescues. Susie watches to see how the other pets react to Dale. Is the resident dog friendly and interested in playing? Are there cats in the home? Susie isn't shy about asking to see where the dog will sleep, eat, and spend most of its time. For instance, she found out the dog will sleep in the family's bedroom, so she asked the family to go the bedroom with her and show her where the dog will sleep: on the floor, his own dog bed, or on the owner’s bed? Is there a doggie door? Is it always available to the dog, or only at times? Will the doggie door ever be available to a new dog when Joe and Mary are away from home? This is important information and Susie makes a mental note to include it in her written report. Susie does a careful inspection of the yard. Is the fence in need of repair? Could a dog dig under, or jump over the fence? Are there items near the fence that could be a launching pad to assist a dog in going over the fence? How many gates are there? Is there a lock on each and is it kept locked? Are there dangerous items in the yard, or otherwise accessible to the dog, such as lawn chemicals, sharp equipment, etc? Oh no! Dale does the no-no and lifts his leg during the home visit! Susie didn’t want that to happen, but since it did, she watches the applicant’s reaction. She apologizes for Dale’s no-no and offers to clean it up. If Joe and Mary are real dog people, they will realize it’s not uncommon for a dog coming into a new area to lift his leg. That will undoubtedly happen when a rescue first comes into his/her new adoptive home and Susie makes a mental note as to how well it was handled by the applicants. Following this visit, she will include their reaction to the event in her written report. Susie recalls vividly a written account of a volunteer who did a home visit during which she talked the entire visit, seldom giving the applicants time to talk. This volunteer missed obtaining valuable information because they did all the talking! Susie knew it was easy to get excited at the opportunity of “talking about dogs” with other dog lovers, but she remembered this was a time for her to keep that under control. Susie asked questions, and then was quiet and let Joe and Mary talk. The more THEY talked, the more SUSIE learned about them. She wasn't anxious to share all her good knowledge on how to do things and quickly learned to listen. She asked questions that encouraged Joe and Mary to talk and give their views on doggie care. Rather than telling John and Mary what they should do if a dog gets loose, she asked them, “If the dog should get out the door and run off, what would you do?” Then she was quiet and waited for them to talk. After Joe and Mary have had ample time to tell her what they know, she then could share with them her knowledge on how to best handle these various situations. She made the visit as relaxed as possible and did her writing after she concluded this visit and left the home. She remembered not to write her report during this home visit, but to do it shortly following, while all this information was still fresh in her memory. While Susie didn’t make the final decision on the placement of a rescue with this family, or which rescue they may get, she was performing a vitally important part of the placement of a rescued Airedale. The report she turned over to Connie Coordinator will provide Connie with information about this family. Combined with information about the rescues in foster care, Connie will be able to make an informed decision on matching the right rescue with the right family. Joe and Mary Applicant will want to know if they have been approved and it was Susie's job to only tell them she’ll be turning in her report and they will be hearing from Connie Coordinator. Enjoy! Home visits should be fun. This article is not intended to tell you all the basics for conducting the home check. You can find that information on our website by clicking here. By expanding a bit on that information you now should have the confidence of a seasoned volunteer to conduct home checks and create written reports on those visits. 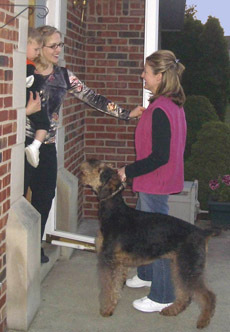 The information obtained during the home check can be critically important in matching an Airedale rescue with the best applicant. 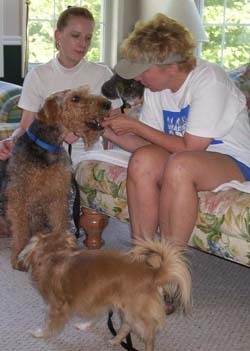 Copyright 2009 by Sally Schnellmann and National Airedale Rescue. Reproduction in whole or in part is forbidden without the publisher's written permission.